A closure is created when the inner function is somehow made available to any scope outside the outer function. You probably shouldn't tell a six-year old about closures, but if you do, you might say that closure gives an ability to gain access to a variable declared in some other function scope. After a function is invoked, it goes out of scope. If that function contains something like a callback function, then that callback function is still in scope. If the callback function references some local variable in the immediate environment of the parent function, then naturally you'd expect that variable to be inaccessible to the callback function and return undefined. Closures ensure that any property that is referenced by the callback function is available for use by that function, even when its parent function may have gone out of scope. Inner functions, also referred to as nested functions, are functions that are defined inside of another function (referred to as the outer function). Each time the outer function is called, an instance of the inner function is created. The following example shows how inner functions are used. In this case, add() is the outer function. Inside of add(), the doAdd() inner function is defined and called. One important characteristic of inner functions is that they have implicit access to the outer function’s scope. This means that the inner function can use the variables, arguments, etc. of the outer function. In the previous example, the “value1” and “value2” arguments of add() were passed to doAdd() as the “operand1” and “operand2” arguments. However, this is unnecessary because doAdd() has direct access to “value1” and “value2”. The previous example has been rewritten below to show how doAdd() can use “value1” and “value2”. A closure is created when an inner function is made accessible from outside of the function that created it. This typically occurs when an outer function returns an inner function. When this happens, the inner function maintains a reference to the environment in which it was created. This means that it remembers all of the variables (and their values) that were in scope at the time. The following example shows how a closure is created and used. There are a number of things to note about this example. The add() function returns its inner function doAdd(). By returning a reference to an inner function, a closure is created. “value1” is a local variable of add(), and a non-local variable of doAdd(). Non-local variables refer to variables that are neither in the local nor the global scope. “value2” is a local variable of doAdd(). When add(1) is called, a closure is created and stored in “increment”. In the closure’s referencing environment, “value1” is bound to the value one. Variables that are bound are also said to be closed over. This is where the name closure comes from. When increment(2) is called, the closure is entered. This means that doAdd() is called, with the “value1” variable holding the value one. The closure can essentially be thought of as creating the following function. Closures can be used to accomplish many things. They are very useful for things like configuring callback functions with parameters. This section covers two scenarios where closures can make your life as a developer much simpler. Closures are useful when used in conjunction with the setTimeout() and setInterval() functions. To be more specific, closures allow you to pass arguments to the callback functions of setTimeout() and setInterval(). For example, the following code prints the string “some message” once per second by calling showMessage(). The following example shows a constructor for a simple Person class. When each Person is created, it is given a name via the “name” argument. Internally, the Person stores its name in the “_name” variable. Following good object-oriented programming practices, the method getName() is also provided for retrieving the name. // person.getName() now returns "Tom"
Personally, I wouldn’t like it if just anyone could come along and legally change my name. In order to stop this from happening, a closure can be used to make the “_name” variable private. The Person constructor has been rewritten below using a closure. Note that “_name” is now a local variable of the Person constructor instead of an object property. A closure is formed because the outer function, Person() exposes an inner function by creating the public getName() method. Now, when getName() is called, it is guaranteed to return the value that was originally passed to the constructor. It is still possible for someone to add a new “_name” property to the object, but the internal workings of the object will not be affected as long as they refer to the variable bound by the closure. The following code shows that the “_name” variable is, indeed, private. // person._name is "Tom" but person.getName() returns "Colin"
It is important to understand how closures work and when to use them. It is equally important to understand when they are not the right tool for the job at hand. Overusing closures can cause scripts to execute slowly and consume unnecessary memory. And because closures are so simple to create, it is possible to misuse them without even knowing it. This section covers several scenarios where closures should be used with caution. Creating closures within loops can have misleading results. An example of this is shown below. In this example, three buttons are created. When “button1” is clicked, an alert should be displayed that says “Clicked button 1”. Similar messages should be shown for “button2” and “button3”. However, when this code is run, all of the buttons show “Clicked button 4”. This is because, by the time one of the buttons is clicked, the loop has finished executing, and the loop variable has reached its final value of four. To solve this problem, the closure must be decoupled from the actual loop variable. This can be done by calling a new function, which in turn creates a new referencing environment. The following example shows how this is done. The loop variable is passed to the getHandler() function. getHandler() then returns a closure that is independent of the original “for” loop. Constructor functions are another common source of closure misuse. We’ve seen how closures can be used to emulate private data. However, it is overkill to implement methods as closures if they don’t actually access the private data. The following example revisits the Person class, but this time adds a sayHello() method which doesn’t use the private data. Each time a Person is instantiated, time is spent creating the sayHello() method. If many Person objects are created, this becomes a waste of time. A better approach would be to add sayHello() to the Person prototype. By adding to the prototype, all Person objects can share the same method. This saves time in the constructor by not having to create a closure for each instance. The previous example is rewritten below with the extraneous closure moved into the prototype. Closures contain a function and a reference to the environment in which the function was created. A closure is formed when an outer function exposes an inner function. Closures can be used to easily pass parameters to callback functions. Private data can be emulated by using closures. This is common in object-oriented programming and namespace design. Closures should be not overused in constructors. Adding to the prototype is a better idea. Lexical scope is when an inner scope can access its outer scope. Here is a modified example he provides in his book series 'You Don't Know JS: Scopes & Closures'. 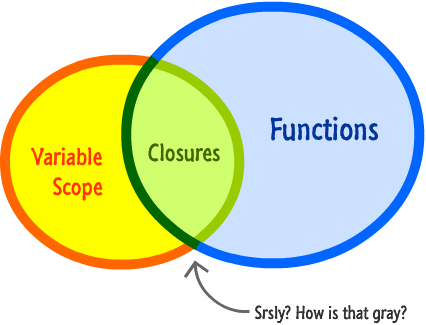 Closures are functions that refer to independent (free) variables. In other words, the function defined in the closure 'remembers' the environment in which it was created. In the above code, count is preserved by the outer function (environment function), so that every time you call counter(), the inner function (work function) can increment it. Closure is when a function is closed in a way that it was defined in a namespace which is immutable by the time the function is called. This is how a beginner wrapped one's head around Closures like a function is wrapped inside of a functions body also known as Closures. newCounter closes over increment, counter can be referenced to and accessed by increment. counter1 and counter2 will keep track of their own value. Simple but hopefully a clear perspective of what a closure is around all these great and advanced answers. Do you know what objects are? Objects are things that have properties and do stuff. Objects are very useful and keep everything nice and organised. Different objects can do different jobs and working together objects can do complicated things. You can also re-assign a variable. Now x means something else. When you make a function, the function has its own "box" for variables. From outside the box, you cannot see what's inside the box. Inside function A, you have "scope access" to x. Inside function B, you have no access to variables inside function A. You now have "scope access". Variable a now means a function, you can run it. Now when you define functions, those functions have access to their outer scopes. When you pass functions around as values, it would be troublesome if that access is lost. You can still access variables in the closure scope. Even though a has finished running, and now you are running c outside of a. You could not get the rock yourself because it was in the caveman's private cave. Only the caveman knew how to find and get the rock. Luckily, he was a friendly caveman, and if you were willing to wait for his return, he would gladly get it for you. Closure are not difficult to understand. It depends only from the point of view. I personally like to use them in cases of daily life. We only need to go through certain steps in particular cases. As for the transformation of materials is only useful when you have the parts. I have read all of these before in the past, and they are all very informative. Some come very close to getting the simple explanation and then get complex or remain abstract, defeating the purpose and failing to show a very simple real world use. Though combing through all the examples and explanations you get a good idea of what closures are and aren't via comments and code, I was still unsatisfied with a very simple illustration that helped me get a closures usefulness without getting so complex. My wife wants to learn coding and I figured I needed to be able to show here not only what, but why, and and how. I am not sure a six year old will get this, but I think it might be a little closer to demonstrating a simple case in a real world way that might acually be useful and that is easily understandable. One of the best (or closest to simplest) is the retelling of Morris' Closures for Dummies example. Closures have access to the containing function's variables. but will not alert though since it returns a function handle to nothing). This demonstrates both of the basic concepts you should get about closures. In simple terms to explain the why this is useful, I have a base function to which I can make references or handles that contain unique data which persists within that memory reference. I don't have to rewrite the function for each time I want to say someone's name. I have encapsulated that routine and made it reusable. To me this leads to at least the basic concepts of constructors, oop practices, singletons vs instantiated instances with their own data, etc. etc. If you start a neophyte with this, then you can move on to more complex object property/member based calls, and hopefully the concepts carry. I think it is valuable to take a step back, and examine a more general notion of a "closure" -- the so-called "join operator". In mathematics, a "join" operator is a function on a partially ordered set which returns the smallest object greater than or equal to its arguments. In symbols, join [a,b] = d such that d >= a and d >= b, but there does not exist an e such that d > e >= a or d > e >= b. So the join gives you the smallest thing "bigger" than the parts. So a closure for the variables a, b, c is the smallest scope (in the lattice of scopes for your program!) that brings a, b, and c into scope. It is like putting some coating around a function. So to a 6-years-old, it could be explained by giving an analogy. Let's say I build a robot. That robot can do many things. Among those things, I programmed it to count the number of birds he sees in the sky. Each time he has seen 25 birds, he should tell me how many birds he has seen since the beginning. I don't know how many birds he has seen unless he has told me. Only he knows. That's the private scope. That's basically the robot's memory. Let's say I gave him 4 GB. Telling me how many birds he has seen is the returned function. I also created that. That analogy is a bit sucky, but someone could improve it I guess. The word closure simply refers to being able to access objects (six-year-old: things) that are closed (six-year-old: private) within a function (six-year-old: box). Even if the function (six-year-old: box) is out of scope (six-year-old: sent far away). // Any methods, variables and properties you define here are "private"
// and can't be accessed from outside the function. Let's start from here, As defined on MDN: Closures are functions that refer to independent (free) variables (variables that are used locally, but defined in an enclosing scope). In other words, these functions 'remember' the environment in which they were created. init() creates a local variable called name and a function called displayName(). The displayName() function is an inner function that is defined inside init() and is only available within the body of the init() function. The displayName() function has no local variables of its own. However, because inner functions have access to the variables of outer functions, displayName() can access the variable name declared in the parent function, init(). Closures can be compared to a book, with a bookmark, on a bookshelf. Suppose you have read a book, and you like some page in the book. You put in a bookmark at that page to track it. Now once you finish reading the book, you do not need the book anymore, except, you want to have access to that page. You could have just cut out the page, but then you would loose the context on the story. So you put the book back in your bookshelf with the bookmark. This is similar to a closure. The book is the outer function, and the page is your inner function, which gets returned, from the outer function. The bookmark is the reference to your page, and the context of the story is the lexical scope, which you need to retain. The bookshelf is the function stack, which cannot be cleaned up of the old books, till you hold onto the page. When you run the book() function, you are allocating memory in the stack for the function to run in. But since it returns a function, the memory cannot be released, as the inner function has access to the variables from the context outside it, in this case 'pages' and 'bookMarkedPage'. So effectively calling book() returns a reference to a closure, i.e not only a function, but a reference to the book and it's context, i.e. a reference to the function getPage, state of pages and bookMarkedPage variables. Point 1: The bookshelf, just like the function stack has limited space, so use it wisely. Point 2: Think about the fact, whether you need to hold onto the entire book when you just want to track a single page. You can release part of the memory, by not storing all the pages in the book when the closure is returned. This is my perspective of Closures. Hope it helps, and if anyone thinks that this is not correct, please do let me know, as I am very interested to understand even more about scopes and closures! Also... Perhaps we should cut your 27-year-old friend a little slack, because the entire concept of "closures" really is(!) ... voodoo! By that I mean: (a) you do not, intuitively, expect it ...AND... (b) when someone takes the time to explain it to you, you certainly do not expect it to work! Intuition tells you that "this must be nonsense... surely it must result in some kind of syntax-error or something!" How on earth(!) could you, in effect, "pull a function from 'the middle of' wherever-it's-at," such that you could [still!] actually have read/write access to the context of "wherever-it-was-at?!" When you finally realize that such a thing is possible, then ... sure ... anyone's after-the-fact reaction would be: "whoa-a-a-a(!)... kew-el-l-l-l...(!!!)" But there will be a "big counter-intuitive hurdle" to overcome, first. Intuition gives you plenty of utterly-plausible expectations that such a thing would be "of course, absolutely nonsensical and therefore quite impossible." Like I said: "it's voodoo." A closure is a block of code where each line can reference the same set of variables with the same variable names. If "this" means something different than it does somewhere else, then you know it is two different closures. A closure is a function that has access to information from the environment it was defined in. For some, the information is the value in the environment at the time of creation. For others, the information is the variables in the environment at the time of creation. If the lexical environment that the closure refers to belongs to a function that has exited, then (in the case of a closure referring to the variables in the environment) those lexical variables will continue to exist for reference by the closure. A closure can be thought of a special case of global variables -- with a private copy created just for the function. Or it can be thought of as a method where the environment is a specific instance of an object whose properties are the variables in the environment. The former (closure as environment) similar to the latter where the environment copy is a context variable passed to each function in the former, and the instance variables form a context variable in the latter. So a closure is a way to call a function without having to specify the context explicitly as a parameter or as the object in a method invocation. // including the parameter storing varForClosure. var contextvar = varForClosure; // use a struct for storing more than one..
For maintainable code, I recommend the object oriented way. However for a quick and easy set of tasks (for example creating a callback), a closure can become natural and more clear, especially in the context of lamda or anonymous functions. Closure can be private and public variables or functions. we can see that even after multiplier has finished executing, the inner function multiply gets still access to the value of x which is 10 in this example. A very common use of closures is currying (the same example above) where we spice our function progressively with parameters instead of supplying all of the arguments at once.